Q. What do you call cheese that isn’t yours? This Saturday’s Humour Moment is dedicated to the cheesy joke. These are the sort of mildly hilarious jokes that make you titter and groan in equal measure. Humour-wise they smell worse than an entire overturned lorry of Stinking Bishop fromage on the North Circular, but are incredibly useful for entertaining the little ones as they grapple with their Cheestrings, Babybels and Dairylea Lunchables. This picture was originally published by the Co-operative group of companies from the U.K. The Co-operative Group is an ethical company that is involved in various services such as funeral care, insurance, banking and retail. It was shared on the Twitter account of the Co-operative’s Food division which runs a chain of low-cost supermarkets in Britain. 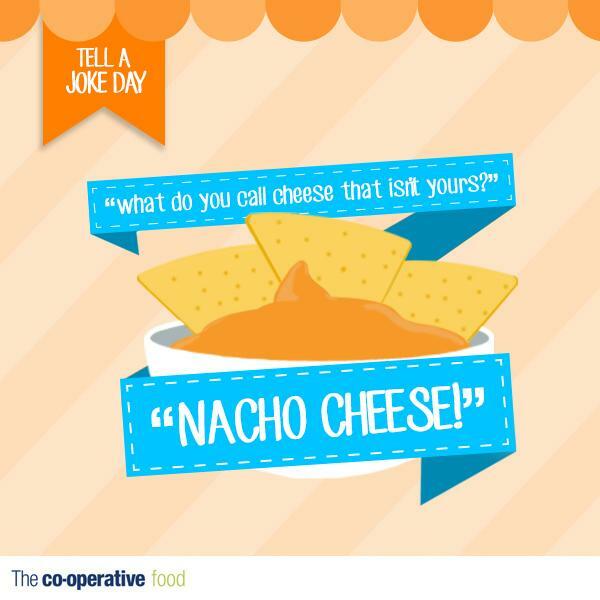 The Co-Operative Food are running a competition for ‘Tell A Joke Day’ where customers are invited to contribute their own food-related jokes, with the best ‘culinary comedian’ receiving a voucher entitling them to a discount on their groceries. Employees and shoppers often affectionately call the institution the ‘Co-Op’ for short, and their supermarkets are a well-loved and long-established face on the British high street. I used to live in Forest Gate (east London) for two years and our nearest supermarket was a Somerfield branch in Woodgrange Road. The Co-Op bought the Somerfield chain in around 2009, and the Somerfield stores took on the conglomerate’s branding and shopfront design. I always found their food to be cheap and usually of high quality although there was not much choice in the Woodgrange store, due to its smaller than average size. I began following their Twitter account a year after I moved out of Forest Gate for nostalgic reasons. While not the biggest fan of cheesy jokes, I would rarely say no to a warm bowl filled to the brim with cheesy nachos drizzled with salsa and herby sauce. When I was working at my old office in Victoria, central London, a group of us colleagues would visit a local pub, the Witton Arms, where we would share our company with a complimentary bowl of nachos infused with melted cheddar, salsa and chopped jalapenos. I relished these nachos, as the softness and creamy taste of the melted cheese was an intriguing contrast with the crunchy texture of the crisps. The salsa helped to give a Mexican taste sensation with its spicy tomato aroma contrasting the more subdued flavours of the cheesy nachos. The nachos were high in demand as the beers made us hungry and were a good conversation starter as well as a food starter – although thankfully not the inspiration for any dodgy jokes. I haven’t yet tried to make this delicious, yet simple Mexican dish at home, but I can tell you this sort of snack would be ideal for any party, especially birthdays and informal get-togethers. Goes great with movie nights too, so you can give the popcorn and microwave a rest. Q: How do you get a mouse to smile? Q: Which genre of music appeals to most cheeses? Q: What is a cannibal’s favourite cheese? Q: Which is the most religious cheese? A: Swiss, because it is holy. Q: What did the Cheese salesman say? A: That cheese may be Gouda, but this one is Feta! Q: What group of cheese has been known to fly? What’s Right Meow: This “Nacho Cat” Recipe Is a Cheesy Delight! The Stink round-up of…the best cheese jokes! I tell this joke all the time and people hate me for it. And I get a good chuckle when they roll their eyes at me.